In collaboration with Willmott Dixon and Caerphilly County Borough Council, AHR created a new secondary school providing 900 places for students aged 11 - 16, located to the North of Oakdale. The new high school is part of a wider 21st Century Schools Programme, which aims to improve the quality of education standards and the condition of school buildings in Wales. AHR was appointed as the delivery architect, to further expand upon the initial designs developed by Caerphilly County Borough Council. Throughout the school building, the colour scheme not only provides differentiation between floors but also provides suitable visual contrast and assists orientation for students, visitors and staff. The school features a number of sporting facilities including a 3G pitch, athletics track, multi-use games area and amphitheatre, as well as a sports hall, fitness suite and changing facilities with the flexibility to be made accessible to the wider community outside of school hours. Consultation with school pupils provided them with an opportunity to express their aspirations for the development of the learning spaces and help build a sense of identity with the school. 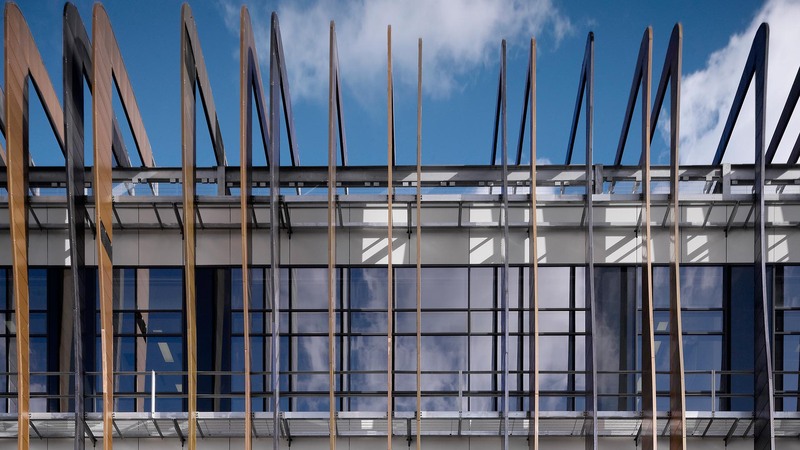 The end product is a building that not only reflects the school’s ethos; Belong, Believe, Achieve but also delivers excellent environmental conditions for learners and teachers. The school officially opened in September 2017 and has been receiving positive feedback from students, staff and parents. Video courtesy of Caerphilly County Borough Council and Willmott Dixon via Youtube.